For sympathy flower delivery in Saratoga Springs NY, Glens Falls, Queensbury and Lake George, rely on the professionals at Meme’s Florist. For funeral, bereavement, or sympathy flower delivery in Saratoga Springs, Glens Falls, or Lake George contact us online today, or simply call 1-866-243-6862 . We can also provide same-day delivery for sympathy flowers to Clifton Park and the Albany region. After hearing the news of a death, most of us are anxious to find someway to express our sympathy and to offer support and nurturing. Although we all know that death is part of life, it is never easy to endure the loss of a loved one. Nothing is more appropriate than the age old tradition of sending flowers. Flowers have a long tradition with the funeral etiquette and rituals. According to Flower Shop Network, archeological records show evidence of flowers being buried with the remains of Neanderthal man. Ancient civilizations across Europe and the Middle East are reported to have entombed flowers with their loved ones. Flowers offer a beautiful metaphor for the ongoing cycle of life beginning as a seed, then as a sprout, to a full blossoming flower and finally wilting petals. Meme's Florist can help during a difficult time by providing local and regional flower delivery to Glens Falls, Saratoga, and Lake George, as well as same-day delivery for sympathy flowers to Clifton Park and Albany bereavement and funeral ceremonies. Flowers bring comfort to the living as they commemorate the lives of the deceased. They express gratitude for the privilege of knowing the departed. There has been a trend in recent years toward “in lieu of flowers…” While a contribution to a charity in the name of the deceased is always a fitting tribute, the value and importance of flowers sent in sympathy can never be understated. Flowers are sent to funerals and memorial services for a variety of reasons. It is often difficult for us to know what to say to show how we feel. Flowers provide a means of expression that help do that for us. Flowers and floral arrangements provide a visual expression of love, sympathy and respect. They represent community support for the bereaved. Flowers can help balance our emotions during the time of death, as the beauty of the flowers softens the pain of loss. Meme's is a Saratoga, Glens Falls, and Clifton Park florist who will create a special sympathy arrangement that reflects an aspect of the deceased’s personality. Wild flowers in a rustic basket with vines and branches are a nice choice for someone who loved the outdoors. A small fishing rod surrounded by flowers arranged in a creel would be a wonderful tribute to someone who loved to fish. A baseball and an emblem of a favorite team for a loyal fan, or you could ask your florist to make the arrangement in the shape and design of a baseball. The list and possibilities are only limited by your imagination and the ability of the florist to accommodate your request. Whatever you do, the family is certain to notice your effort and appreciate it. The floral design professionals at Meme's Florist can help when deciding the style of arrangement to send. Different religions and cultures often dictate the colors and types of flowers appropriate to send. There are many choices of arrangements available, but they usually fall into these categories. 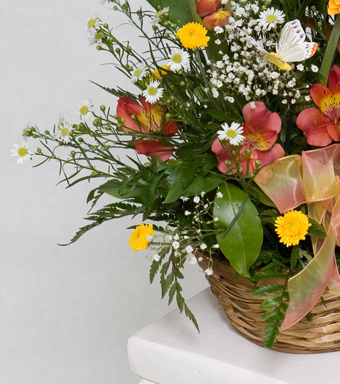 Vase or home-style arrangements are usually sent to the funeral home with the intent that a family member will take them home after the service. Sometimes these are sent directly to the home of the family. Funeral flower wreaths come in a variety of shapes and sizes. Wreaths bring a special meaning to the service. The circular shape is the symbol for eternal life. These go to the funeral home and a cemetery if a burial is scheduled. Funeral flower sprays come in several styles, but most the common are the standing sprays and the easel sprays. These are also delivered to the funeral home. Live plants and dish gardens are often welcomed as gestures of sympathy and condolence. The spathefora or peace lily is a very common plant to send. Fresh flowers from our Saratoga flower shop can be added to any live plant arrangement to brighten it up for the service. These can be sent to the funeral hom e or to the home of the family. Casket sprays are usually ordered by the immediate family. They come in a variety of sizes, but the two most common are the full length and the half length sizes. The full length extends over the full length of the closed casket lid. The half-length arrangement covers the closed portion of an open casket. Sympathy Gift baskets containing flowers, plants, fruit, gourmet food items are nice to send to the home of the family. It is usually not considered appropriate to send these to the funeral home. Military funerals usually follow specific practices. If a flag is draped on the casket, then only standing sprays are used. 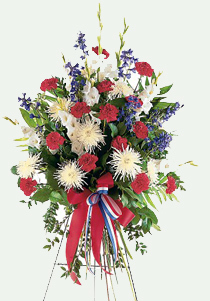 Funeral flowers with red, white and blue are often requested. Military symbols can be used with the funeral flower arrangements. In some cases, we only learn about a death after the funeral has taken place. Do not despair. It is considered proper to send condolence flowers to family members at their homes up to a month after the funeral services. According to Flower Shop Network, some people prefer to send flowers at a later date. Although the initial outpouring of support is great comfort during the funeral, a few weeks later the bereaved often feel lost and alone. Sending flowers or a plant with a personalized message lets them know you are still thinking of them.